A classic winter container plant. A classic plant for winter containers. Cones of fragrant white flowers. Easy to grow and look after. Supplied in bud in a 2L container. If you're looking for a perfect garden plant then 'Rubella' has it all - it's compact, low-maintenance, grows in dappled shade, looks good all year, has fragrant flowers and is wildlife-friendly. It's one of those 'plant it and leave it' shrubs, so there's little wonder why they sell out so quickly! 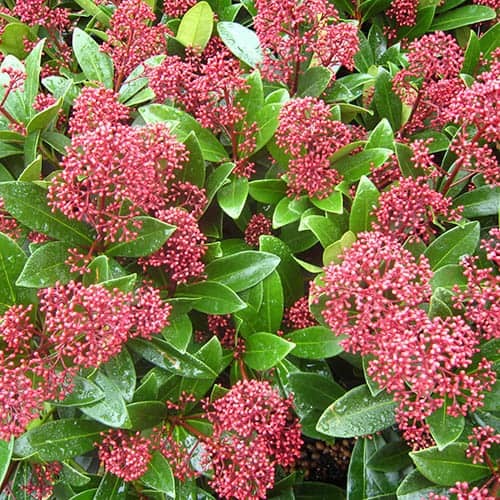 Skimmia japonica 'Rubella' is a compact, bushy evergreen shrub with cones of red buds which open to fragrant white flowers in early spring - A classic plant for winter or spring containers where the dark, leathery leaves provide a super background for its showy flowers. All parts of this award-winning plant have a pleasant fragrance when crushed, not unlike ..... so, position them near doorways, entrances or windows so that you can appreciate the scent too. Most individual varieties of Skimmias are either male or female - 'Rubella' is male so will not produce berries - but when you see and smell the gorgeous scented flowers, they more than make up for that. Skimmia plants are slow growing, so little pruning is needed - which is great if you have little time to be messing around with secateurs and pruning manuals - in fact, it is better not to trim them at all, if possible. Add to this the fact that 'Rubella' holds an RHS award of garden merit and you can be assured that it will perform in your garden. Supplied as an established plant in bud, in a 2L pot. Grow Skimmia plants in a dappled or fully shaded position, in moderately fertile, rich, well-drained soil, preferably neutral to acidic in pH. Avoid full sun, as this can cause yellowing of the leaves. Alternatively, and easier, grow Skimmia in large containers, using a soil-based compost such as John Innes No.3 mixed with ericaceous compost.